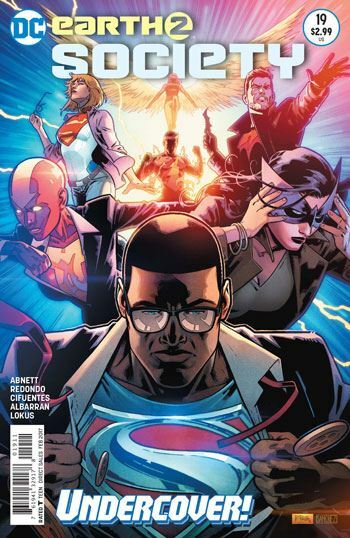 A new world has been born in Earth 2 Society #19, and the heroes who remember the previous Earth are trying to find a way to fit in. In this story, Earth 2 is back, inhabited and resource-filled, with all those living there completely unaware that this world has just sprung into being, created by what appears to be a consensus of wishes, after Fury used Pandora’s Box. The remaining heroes from the previous world know that this is a new planet, and spend a fair amount of this issue getting their bearings, and trying to fit it. They are in two groups, but all of the heroes are being monitored by the spooky Sandmen. At first, the world they have arrived in seems idyllic. It is peaceful, with no war and little crime. But they notice that there are no super-heroes, or wonders, as this series calls them, on this world. And a little digging reveals that this perfect world is really a cold an authoritarian one. Although I will not give away who the villain is behind this situation, it’s really not very hard at all to figure out. If one has been reading this comic, it’s the only possible choice. Despite that, it’s a good issue, well written, with very nice art. But as each issue of this apparently final storyline goes on, I wonder more and more what is meant to become of this world, and this comic, as Rebirth plays out.